Ten Speed Press, 9781580089456, 208pp. The modern guide to cooking at home using a wood fire, with more than 100 diverse recipes. 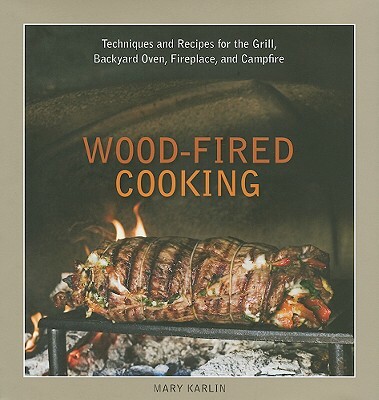 This contemporary collection of recipes from chef-instructor Mary Karlin covers the range of wood-fired cooking options available to home cooks. From flame-licked Plank-Roasted Porterhouse or Grilled Naan to a hearth-baked Milanese Risotto, Leek, and Asparagus Tart or Warm Chocolate-Chipotle Cakes, Karlin's unassuming yet refined kitchen sensibility shines through in every dish. With a vast knowledge of terrific ingredients, the diverse flavor characteristics of hardwoods, and the best live-fire techniques and equipment now available, Karlin is a passionate advocate for this growing trend. MARY KARLIN is a founding staff manager and chef-instructor at Ramekins Sonoma Valley Culinary School, where she has taught wood-fired cooking classes for nine years. Mary has also taught at Draeger's, Rancho La Puerta, and the Culinary Institute of America, Greystone. A freelance food writer and traveling instructor, Mary splits her time between northern California and Superior, Arizona, where she directs her Live-Fire Cooking Camp Culinary Center. She also teaches regional cooking camps around the United States. What's your most essential kitchen tool? What was your inspiration for writing Wood-Fired Cooking? My wood-burning oven; the food and community created by it. The oven made me a better cook. If you had to boil the message of Wood-Fired Cooking down to one sentence, what would it be? Stay connected to your food. Cook ethically, share food with others and create community wherever you can. Right out of clothing design school, I was the assistant to a clothing designer in San Francisco. She was the co-owner and wife of an A-1 screamer. The place had all the fantasy images and sounds of what I thought was the typical garment manufacturer's life. It was a pressure cooker and in the first 6 months I developed an ulcer and quit. I thought that was the end of my life in the garment business. Thankfully, I was wrong and went on to other joyful positions at great companies, spending over 25 years of my life in that world. Next career, food.